Le Courrier de l'Air was an airdropped leaflet newspaper for occupied France and Belgium. Printed in London, it was dropped over the First World War Western Front by free-floating paper balloons. Courrier was the production of a branch of Military Intelligence known as MI7b and from May 1918 edited by Edward Heron-Allen. Here follows a report written by Heron-Allen in November 1918 giving the production history of Courrier He had joined the staff of the War Office on Tuesday 13 May 1918, as assistant editor of Le Courrier de l'Air. The same title would be resurrected for a new airdropped newspaper in the Second World War. Le Courrier de l'Air was, as its title denotes, a propaganda paper, planned by Captain (Dr.) Chalmers Mitchell, D.Sc., F.R.S., O.B.E., to be distributed over the parts of France occupied by the Germans, and over Belgium, with a view to giving the inhabitants of these areas accurate news of the progress of the war, from the point of view of the Allies of the Entente. In addition to this it contained extracts from German Papers which were suppressed by the government when they contained matters reflecting upon adverse conditions in Germany and accounts of German defeats and losses. The average number of copies distributed weekly was 5000. Balloons used to drop propaganda leaflets over the First World War front lines. 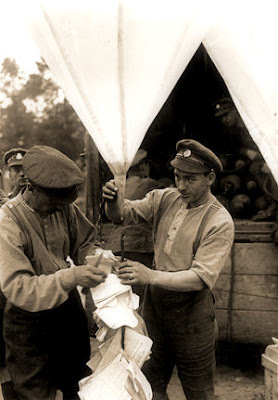 The papers were distributed by hydrogen balloons, which were sent up from our side of the fighting lines whenever the direction of the wind was favourable. It was threaded in bundles of a hundred upon a silk paper-fastener, which was passed through a 20-inch length of tinder yarn, such as is used for lighting cigars and cigarettes, at intervals of about three inches. The tinder was strengthened and supported by a strong wire running through it, by which the whole mass of bundles—called a "release"—was firmly twisted on to the neck of the paper hydrogen balloon. Prior to letting it go the tinder was lit at the top and as the "smoulder" reached each paper-fastener, it burnt it away and a bundle of the papers flew away, falling all over the country. Each balloon carried about 15 lbs. of papers, in all about 2000 copies, and it took from 20 minutes to half an hour to distribute its load. A complete set of photographs showing the process has been taken by the Official Photographers to the English Army and may be bought at their sales Dept in London. I joined the Staff of the War Office, in the M.I.7.b.4. Department of the Ministry of Intelligence in May 1918, as Assistant Editor of the Courrier my colleague in the editorship under Captain Chalmers Mitchell being Captain the Hon. R.W.D. Legh. * On the translation of Captain Mitchell to the Crewe House Branch of the Ministry of Intelligence I became sole Editor, attached to M.I.7.b.l., under Major C.J. Street and was responsible for the paper until the last number, No.78, the signing of the Armistice on the 11th November 1918, rendering the further publication and distribution of Propaganda Literature in the Occupied Territories unnecessary. In one of the M.S. notes in this volume I have described the papers which I read daily to make extracts for the Courrier. These extracts were, when further selected and weeded out by me, submitted to Capt. Mitchell, Major Street or his second in command Capt. Allen, to advise as to which seemed to be the most suitable, and the final selections being made, those extracts which were from French papers were sent to the Avenue Press in Drury Lane to be set up in print, and those which were in English were sent to Miss Marcelle Ducros, the Official Translator to the Department, to be translated into French, and when she returned them they were likewise sent to the printers. 1. Current and Historical—matter relating to, or commenting upon recent events which had to be used before they became ancient history or out of date. 2. Permanent and Academic—matter relating to affairs and general conditions in Germany, criticisms from German papers, and general articles upon the war activities of the Allies, which were good for use at any time. 3. Humorous and Abusive—comic, scurrilous, or scandalous stories about the Germans, revealing their weaknesses or immoralities, and making fun of their Institutions and war regulations. 4. Leading articles on matters of current importance, taken from the leading papers, or written by myself. Every Thursday I made up the Back Page of the next week's Courrier from the matter I had standing in type, pasting the paragraphs on the back of an old number. This went to the printers, with the duplicate corrected proofs attached, with instructions for its return revised in page form by the following Monday. On Monday morning this came back, and at the same time I received from M.I.7.b.l. the "Weekly Resume" of Military Operations, which had been passed by the Censors of the Press. This I "edited" cutting out all mere "literary matter" and events on the Salonika, Bulgarian, or Palestine Fronts, which would be of no interest, excepting on very broad lines, to the Belgians and French. Thus "cut" it went to Miss Ducros to be translated. On Tuesday afternoon Miss Ducros came to Adastral House, with the translation. I then wrote—if necessary—the "Derniere Heure" paragraph, relating any important events that had occurred since the previous Friday when the "Weekly Resume" is completed, and Miss Ducros translated it in the Office. At 5 p.m. the leading Article, the Resume "Sur le Front Occidental," the "Derniere Heure," and any current paragraphs to fill up the front page went to the printers. On Wednesday morning this came back in proof-slips, and whilst the messenger waited I "made up" the Front Page, and returned it for "revise" by the messenger. Any time after two o'clock on Wednesday I went to the printers in Drury Lane and "passed" the Front and Back Pages finally for press, after which I did not see the paper again until my sheaf of "file" copies was delivered in my room at Adastral House on Thursday afternoon. The copies for distribution were sent direct from the printers to Woolwich, where they were made up into bundles on "releases" as above described and sent over to the Censorship and Publicity Section at General Head Quarters, near Montreuil in France. From here they were sent by motor lorry to the sections operating on the French and Belgian Fronts, under the direction of Captain Hazledine, who was our head representative at G.H.Q., and sent over the lines as described. Of the effect of this Aerial Propaganda, not only the Courrier but the mass of German leaflets sent over the lines on the southern fronts, there can be no question. The German papers for the last two months of the war have been full of fulminating complaints of our "poisoned arrows from the air" which have seriously damaged the "morale" of the German troops. I append a cutting from the Times of the 16th of September 1918 describing the "Courrier of the Air", and stating that at Ghent Major von Blucher had issued a proclamation threatening them with a fine of £150 or one year's imprisonment, or both, if they failed to hand over immediately any literature dropped by airmen in Belgium, and so lately as the 2nd of November last, an extract from the letter of a high German official, published in the Cologne Gazette, was published in all the London papers, which stated: "What caused the most damage was the 'paper' war waged by our enemies, who daily flooded us with some hundred thousand leaflets, extraordinarily arranged, and well edited." I need hardly say that this is a paragraph which afforded me the highest satisfaction. During the course of an Official visit to the Western Front in October last, I happened to visit Bruges two days after the Germans had evacuated the city. Several members of the College des Echevins whom I interviewed told me that the Courrier was eagerly looked out for, and sought for during the whole of the last year of the occupation, in spite of the fact that in the later months, the fine for being in possession of a copy had been increased to 10,000 marks, in addition to the one year's imprisonment. I was told that the first copy of each issue that fell into the hands of the Germans was translated and circulated to all the Commands, and that if any one were caught relating a story or piece of news from it, the source of his information was traced back from one person to another until they discovered who had originally picked up the Courrier and read it—and the punishment then followed. No.78 was the last number of the Courrier de l'Air actually published. The back page of No. 79 was however prepared by Captain Ozanne, and set in to page form during the end of the week 7–9 November 1918. Peace being declared - or rather the Armistice being signed on the 11th—the Courrier became functus officio and when the Back Page proof of No. 79 was brought to me on the morning of the 12th of November, I notified the printers that the Courrier would not be published again and that the standing type would be distributed,or rather melted down, as it is all set by linotype. A complete file of the Courrier is extraordinarily scarce—the system of filing papers at the Ministry of Intelligence leaves much to be desired, and I doubt whether the Department itself possesses a complete set—it took me four months assiduous search in London and in France before I succeeded in completing my own file and one which I designed for the Library of the British Museum. Heron-Allenby - any relation to general Allenby?